With a little over a month until release, the first review has appeared of my Dark Osprey book Werewolves: A Hunter’s Guide. It’s short but sweet, and I’m looking forward to more. 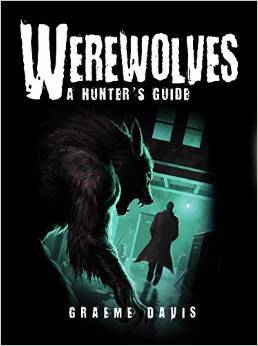 Werewolves: A Hunter’s Guide is for the Dark Osprey line which focuses on horror and conspiracy, and follows on from earlier volumes about Zombies and Vampires. I collected werewolf legends and trial reports from across Europe and researched shapechanger myths worldwide to paint a picture of lycanthropy that expands upon what you will find in most movies, games, and novels. It touches on the standard fare – silver, the moon, Viking berserkers, SS werewolves, and so on – but I also uncovered a few surprises. Like, for instance, the fact that there are at least four distinct types of werewolf, each with its own unique characteristics. And the Greek tradition that a dead werewolf rises from the grave as a vampire. And the ancient werewolf cult that centers on Mount Lykaion in Greece. As I find new reviews, I’ll post links in the comments section below. An order of devout warrior knights? An arrogant multinational, accountable to no one? A cabal of diabolical warlocks? Saviors of lost wisdom? Guardians of a secret that could bring down the Catholic Church? Victims of a plot by Popes and Kings? The Knights Templar have been called all these things and more. I grew up on the Roger Moore Ivanhoe TV series (before he was The Saint, and way before he was James Bond) and a subtitled import of the French series The Accursed Kings, as well as fantasy and horror sources like the TV drama The Dark Side of the Sun and late-night showings of imported movies like Tombs of the Blind Dead. I also read everything from Enid Blyton’s retellings of stories from the Crusades to The Holy Blood and the Holy Grail and The Da Vinci Code. Somewhere in the middle of all this I started playing D&D, which probably didn’t help my obsession with medieval mysteries. About a year ago, I wrote a roleplaying sourcebook on the Order of the Poor Knights of Christ and the Temple of Solomon, to give them their full name. It covers the history of the Order and the various legends and conspiracy theories that have grown up around it since its suppression in 1312, as well as an outline of the role that surviving Templars play in Rogue Games’ Colonial Gothic historical horror RPG. The book was originally released in various electronic formats, but Rogue Games owner Richard Iorio II has decided that it merits publication in printed form. More than that, it’s getting a new layout and and added section: an excerpt on the Templars taken from Thomas Wright’s resoundingly-titled opus The Worship of the Generative Powers: During the Middle Ages of Western Europe. Published in 1865, this remarkable work takes a sweeping view over practically the whole of religion, including “the study of certain abnormal practices incidental to membership in secret orders and societies.” Needless to say, the Templars were accused of plenty of those during the torture and trials that preceded their dissolution. A 10-page preview of the book is online at the Rogue Games web site, and the book itself should be available later this month. Meanwhile the original PDF and Kindle versions are still downloadable, sans the chapter from Wright. Sherriff: I represent the King! Templar: And I, the King of Kings.